From information technology consulting to business process improvement and technology services, our business consulting services combine proven, disciplined approaches with real-world experience. When you need help to evaluate technology for your business or how your web site is align with your business, contact John Clarke Consulting to complement and enhance the way your company does business. • The CHAOS research time line is evidence of steady improvement in IT project management. In 1994, only 16% of application development projects met the criteria for success-completed on time, on budget, and with all features/functions originally specified. In 2000, 28% of projects were in the successful column. • Most browsers know how to deal with correct HTML. However, if it is incorrect, the browser has to repair the document, and since not all browsers repair documents in the same way, this introduces differences, so that your document may look and work differently on different browsers. The time constraint refers to the amount of time available to complete a project. The cost constraint refers to the budgeted amount available for the project. 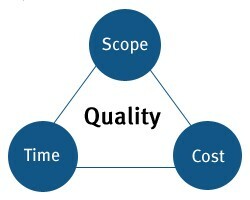 The scope constraint refers to what must be done to produce the project's end result. These three constraints are often competing constraints: increased scope typically means increased time and increased cost, a tight time constraint could mean increased costs and reduced scope, and a tight budget could mean increased time and reduced scope. John Clarke Consulting providing services in Project Management, Information Technology and Website Consulting. "Treat everyone you meet like you want to be treated." Copyright © 2005-2019 JohnClarkeConsulting.com - All rights reserved.